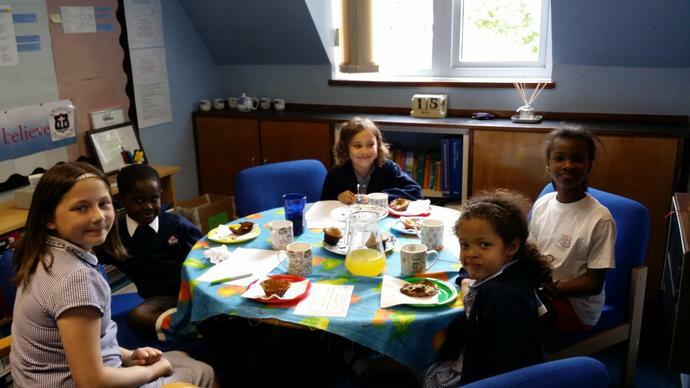 Amy (Y5), Evie (Y4), Faramade (Y3), Elle (Y2) and Josiah (Y1) visited Mrs Young for tea this week. They have all worked hard in their learning. Josiah has worked hard to improve his joint up handwriting and Elle has also improved her writing. Evie has excellent behaviour and Faramade has written an excellent version of Pandora's Box. Amy has worked hard in every lesson. No one from Year 6 came this week because they had a party of their own. They have been working so hard on their SATs exams that Mrs Smith treated everybody to doughnuts in class.